Hailing from North Texas, Avery Jeffry has been a performing bassist and guitarist for over 15 years. Beginning with rock ‘n roll and the blues, he has garnered experience in nearly every genre with collegiate level training in both classical and jazz. Avery began his classical and music theory training on the upright bass in middle and high school, eventually performing with the Plano East Senior High Chamber Orchestra in one the most competitive school districts in the state of Texas. 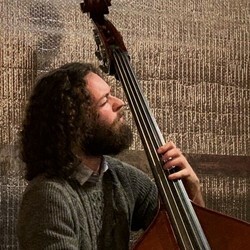 He then obtained his Bachelor of Music degree from the University of South Carolina with an emphasis in Jazz Performance on the upright/electric bass. While there he studied with bassist Craig Butterfield and pianist/guitarist Bert Ligon. Avery has performed with professional bands all over Texas, South Carolina, Virginia, and California, and has also performed abroad with various groups in Tokyo, Japan. He has recorded multiple albums with the instrumental world music group Vanilla Summit and played two showcases at the world renowned SXSW Music Festival in Austin, Texas in 2017. Avery is currently a freelance musician and lesson instructor in the Sacramento area.